Origin and Habitat: Durango and Chihuahua, mainly near El Salto. Krainzia longiflora (Britton & Rose) Backeb. Phellosperma longiflora (Britton & Rose) Buxb. 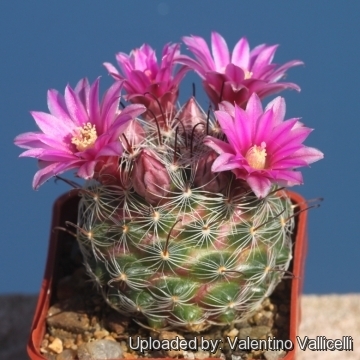 Description: It is a high-altitude variant of Mammillaria longiflora. 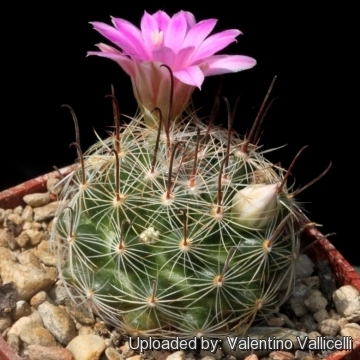 lt is similar to the species but has larger tubercles, shorter central spines and uniformly, soft pink petals. 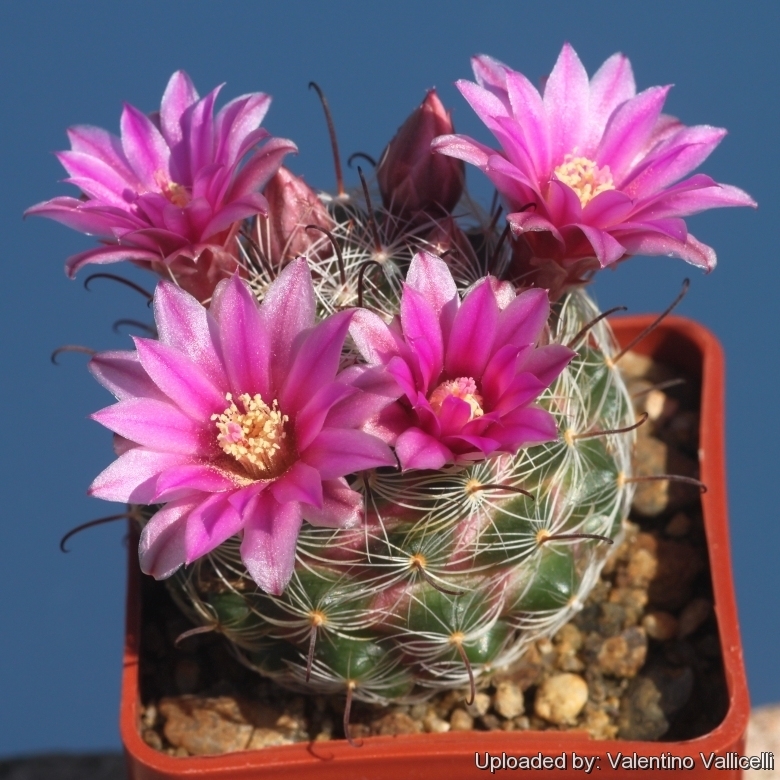 It is one of the most attractive members of the genus with large blooms often as large as the plant itself. 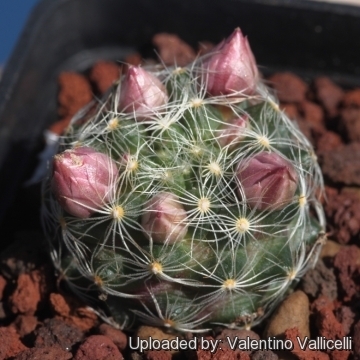 Mammillaria longiflora (subsp. 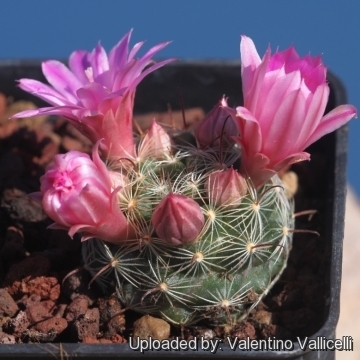 longiflora) normally stays as a single short column, while Mammillaria longiflora subsp. stampferi will form small clusters. Stems: Globular to slightly elongated, fresh green to dark green, about 3-6 cm tall and 5-9 cm in diameter. Tubercles: Cylyndrical 5-10 mm long in 5 and 8 spirals, dark green, somewhat paler near the bases, cylindric, terete, with watery sap and axils almost bare or slightly felted. Areoles: Oval, with a little white felt becoming naked as they ages. 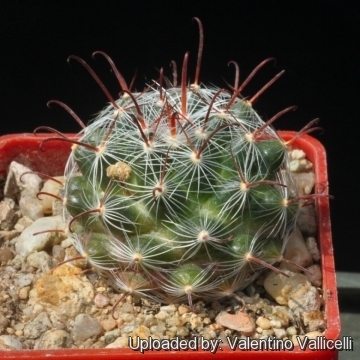 Central spines: Sometime absent or 4, yellowish-white, to dull-red of which the lower one hooked usually less than 12 mm long and the upper 3 straight even shorter. Radial spines: About 30 white or yellowish. 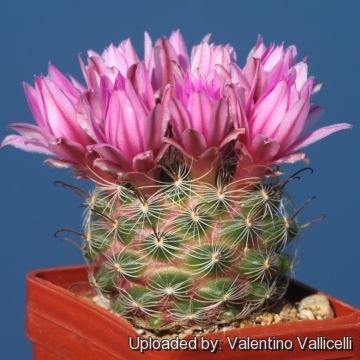 Flowers: Unusually large for a Mammillaria, bell-shaped to broadly funnelform, approximately 25-40 mm long, 20-30(-40) mm in diameter uniformly, soft pink. Fruit: Small, criptocarpic (remaining sunken into the body). 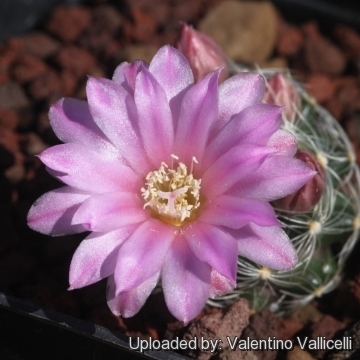 Mammillaria longiflora (Britton & Rose) A.Berger: Subsp. longiflora has about 4 central spines and pale to deep purplish pink flowers with darker midveins. Distribution: Sierra de Cacaria, Durango. 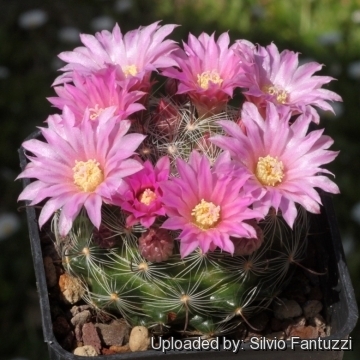 Mammillaria longiflora subs. stampferi (Repp.) D.R.Hunt: has larger tubercles and shorter central spines usually less than12 mm long; flowers uniformly, soft pink . Distribution: Durango and Chihuahua, mainly near El Salto. Cultivation and Propagation: It is one of the more difficult species to grow long enough to produce clumps, but if grown correctly, it will reward the grower with generous displays of purple flowers; plants should be allowed to become crowded in their pot. Keep in shallow and smaller pot than normal. Must have very well draining potting soil.